Treasure Mountain Herk. Crystal Grove Herk. Crystal Grove Herks. Herimer Mines and Resort Herk. The majority of these specimens are from Treasure Mountain in Little Falls, NY. Top quality pieces mostly recovered over the past decade by myself. There is a lot of variety in the specimens from these locations: combination pieces with calcite, parallel growth clusters, intergrown groups, inclusions of anthraxolite, fine skeletal growth crystals, Herkimer diamonds on dolomite crystal matrix, internal shaft scepters and of course those beautiful and very rare fully formed scepters. I won¹t describe the dozens that are white, have some damage, major blowouts discolorations or other problems. No junk here. These are nice specimens for the price. 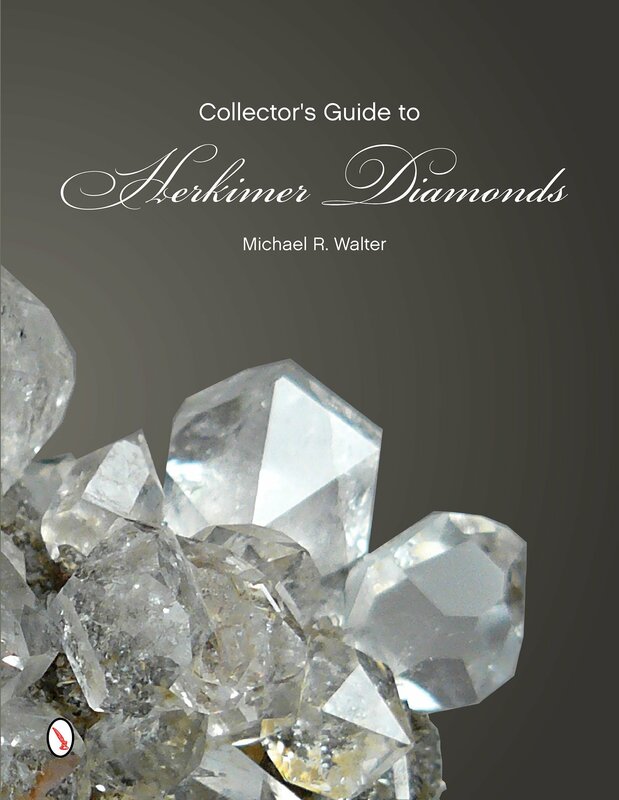 Of the hundreds (perhaps thousands) of Herkimer diamonds I have sold over the years, not a one has ever been returned or mention to me in any negative way by a customer. I attempt to keep the price at what would be considered by most a wholesale level. Sorry about the less than perfect photos. Of all the minerals we work with these are probably the toughest to get good photos of. Don't forget to read our articles on Diamond Acres and Treasure Mountain. OKN-845 Herkimer Diamond RESERVED Herkimer Diamond Mines and Resort, Middleville, New York. Collected by Jay Walter, October 23, 2014. This specimen measures 10 x 9.8 x 5 cm and has a Herk within a vug that is approximately 2.2 cm. It sits upright nicely an almost flat base. This base has a hole going up into the vug that allows for light flow. The crystal displays nicer than it appears in the photos and if base lit it displays magnificently. It could be trimmed down more but also has a vug up higher with dolomite crystals in it so it has not been further reduced in size. Should probably be displayed on right hand edge with the crystal up higher on the piece but I failed to photograph it that way. No damage and better than the pics indicate. $80 is a great price on this one!